The Dakota Access Pipeline (DAPL) has generated a great deal of controversy since it was first announced by Energy Transfer Partners (ETP) in June 2014. The underground oil pipeline will be 1,170 miles long when completed (it passes through Illinois, Iowa, and the Dakotas), and will cost $3.8 dollars in total. The necessity of the pipeline has been questioned by many, and the threat it poses to the environment has been raised time and time again. Members of several American Indian tribes, most notably the Sioux Nation, have condemned the project as a severe cultural and environmental threat. Although it will not pass through their Standing Rock reservation, it threatens culturally significant and sacred lands, where many tribe members’ ancestors are buried. This is not to mention the catastrophic environmental impact that the DAPL would wreak on the area if it were to burst. Part of the pipeline is under construction near the Missouri River, which feeds into Lake Oahe, a major source of water for residents of the Standing Rock reservation. It is certainly not unheard of for pipelines of this nature to burst and destroy acres of land and entire bodies of water. 176,000 gallons of crude oil were spilled into a North Dakota creek late last year, only 150 miles from Standing Rock. Significantly, the DAPL was originally intended to pass near the North Dakotan capital of Bismarck, but the city’s predominantly white residents objected on the grounds that it would threaten their drinking water, and the pipeline was subsequently rerouted to its current location. 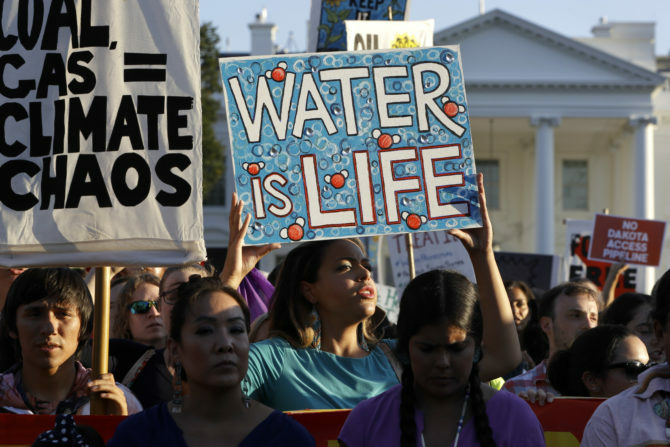 This example of environmental racism is not a one-off event, and the imminent destruction of American Indian land comes as part of a long and shameful history of US federal government persecution against its indigenous population. Despite signing countless treaties securing land ownership to American Indian tribes, the US government has repeatedly breached the terms of these treaties, and drastically reduced the territories of native peoples, destroying culturally and spiritually significant areas in the process. Standing Rock’s Historic Preservation Officer, LaDonna Brave Bull Allard, has stated: “The US government is wiping out our most important cultural and spiritual areas. And as it erases our footprint from the world, it erases us as a people. These sites must be protected, or our world will end”. There have been significant protests in opposition to the DAPL which have garnered international attention. In April 2016, the Sacred Stone Camp was established at the construction site near the Missouri River, and was inhabited by representatives from over 200 Indian nations. They were later joined by environmental groups, veterans’ groups, religious groups and private citizens, whose numbers reached around 10,000 at its peak. Activists have been subject to violence and brutality by law enforcement officials, who have used rubber bullets, teargas, pepper spray and dogs against camp inhabitants, and set water cannons on them in sub-zero temperatures. The resistance is not over, however. As drilling began again last week, activists returned to the camp, and there has been a lawsuit between the Standing Rock and Cheyenne tribes and the federal government ongoing since September last year. Moreover, several marches have been planned in Washington and across the US on 10th March, in the hope that the government will reverse its decision. We must hope that this continuing activism will convince the Trump administration to end construction of the DAPL, and begin a reversal of the historic pattern of racism and discrimination that American Indians have been subjected to for too long by the US federal government.